While most temperatures are known to contract or expand when temperatures change from cold to hot, water behaves in a different manner. When water freezes, it expands, taking up 10% more volume than it did as a liquid. This is fine when you are freezing ice cubes, however, when this occurs in a confined space, it can cause serious damage to your concrete foundation. Freezing water that occupies a crack in a home’s foundation can exert tremendous force – anywhere from 20,000 to 80,000 pounds of pressure per square foot. Frost heaving, when concrete is damaged by freezing water expansion, can cause serious structural damage to a home or building. To repair heaved concrete and to prevent it from occurring in the future, it is imperative that you seek the expertise of a foundation repair specialist. Anglin’s Foundation & Masonry Repairs is the company that you can turn to for all of your foundational and masonry repair needs. We have over 85 years of experience correcting foundational issues and repairing them in order to reinstate the integrity of a home of business structure. It is essential that you understand that repairing damage done by frost heaving is not enough. At Anglin’s Foundation & Masonry Repairs, we will work to diagnose the cause of the issue and to determine ways to avoid heaving in the future. We do not stick a “Band Aid” on any issue because we understand that your foundational issue will not be resolved in that manner. We will provide whatever techniques are necessary to solve the issue and to keep it from reoccurring. Drainage techniques can be used to prevent soil saturation from occurring next to your foundation, steel anchors or piers may be needed to make the basement walls or slab more stable, or other specific techniques may be required to reestablish the integrity of your property. 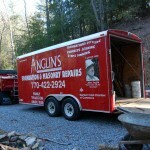 Anglin’s Foundation & Masonry Repairs is here for you. We are the trusted name in Georgia for the most superior foundation and masonry services. Call us today to discuss your concerns with frost heaving.